Fusion is about blending IT into the business, and it is a recipe for business integration and innovation. But what are its ingredients and how do you make this happen ? Get this brandnew book free with your seminar participation. It has never been more challenging in the world of IT. Yet at the same time the role of IT and the role of the CIO have never been more questioned. This dilemma is a fundamental indicator that we�re at the tipping point of a dramatic change in IT, a complete repositioning of IT and a need for a totally new breed of IT professionals to tackle these challenges. The bad news is that the role of IT - and the role of the CIO in particular - has never been scrutinized more than today. In a lot of companies there is very little trust between business and IT and every single incident or issue is seen as an opportunity to highlight the incompetences of the technology department. This is no surprise as only 25% of IT projects are deemed successful and billions are spent on ill-conceived technology projects (according to e.g. Gartner and Standish Group). In the past 30 years, wonderful models have been developed on the relationship between business and IT. In spite of all these models there has been no major improvement on the trust between business and IT. On the contrary, the trust between business and IT in most companies has never been as bad as it is today. So we come to a fundamental dilemma: It has never been more challenging in IT, and yet, the relationship between business and IT is at an all time low in terms of trust. What will you learn during this seminar? For more than 15 years, we've studied the concept of Alignment between business and IT. Alignment talks about the relationship, positioning and role-patterns between the IT department and the various business functions. Models have been produced, papers have been written, patterns have been identified. We now know more than ever before about the mechanics of Alignment, and still the relationship between business and IT in most companies has never been worse. So, is Alignment a dead-end street ? We believe the new concept is Fusion. And really, we don't mean that Fusion is just the 'new word' for Alignment. Although the underlying principle remains the same, Fusion holds a much stronger and powerful meaning - where Alignment implicitly calls for a two-party system to collaborate, Fusion is about a strong convergence between the two. Even the two melting together. Fusion means blending IT into the business, and no longer treating IT as a supplier but completely integrating IT into the business. This has great potential, because instead of wasting a lot of energy in fighting between business and IT, you use this energy in allowing IT professionals to work with the business to deliver results in a more efficient and effective way. Fusion results in a melting-pot of business and IT thus paving the way for more innovative and integrated business models. Fusion will put IT into the business, and fully into the strategic and operational reality of a business, instead of seeing IT as a 'staff function'. Fusion will allow companies to focus on Technology-enabled Innovation, instead of just on the commodity-savings potential of technology. Fusion will allow a new type of organization to be created, out of the ashes of the old IT department, that will evolve from an 'executional technology function' towards a 'pro-active strategic innovation function'. Fusion will allow companies to focus on maximizing value from technology innovation. This 'new' way of thinking about IT, is what we refer to as IT 2.0. It is time for a major transformation of IT. It is time for a quantum leap. For years, the way we have run IT, as a CIO, was to command an army of order-taking specialist workers, an underground army hidden away in the basement of our companies. These reactive armies of craftsmen are a thing of the past. Learn more about Business/IT Fusion, the possibilities of this new way of thinking, and the new role of IT (and of the CIO) at this unique one-day seminar, presented by Peter Hinssen. This seminar is based on Peter's brandnew book "Business/IT Fusion. 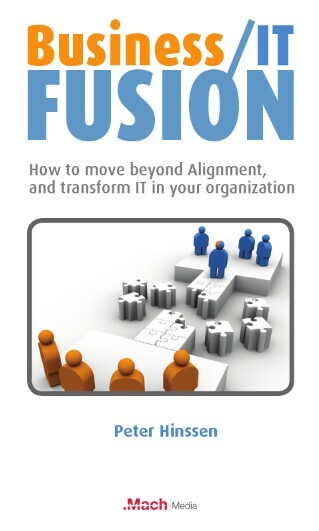 How to move beyond Alignment and transform IT in your organization" (published by Mach Media NV, ISBN: 9789081324236). You get this book free with your seminar registration, and it is both excellent reading material to reinforce what you have learned at this seminar, and a great tool to implement Business/IT Fusion in your company and transform your IT organization. What is Business/IT Alignment, Business/IT Fusion and what is the difference between the two ? What will the new IT organization look like ? How will it function, particularly in its relationship with the business, and with its suppliers ? How can we implement "Intelligent Governance" and move from budget thinking to portfolio thinking ? How will we staff these new IT organizations ? What are the new skills and competencies that will be required from these people ? Better alignment by improved communication: how do you put this into practice?